As Dr. Kevin Barrett has reported, our recent book tour of Western Canada culminated in an attempt by the B’nai Brith to shut down our event on Aug. 16 at the Rossdale Community League Hall in Edmonton Alberta. Due in large measure to the principled fortitude of the community hall’s manager, Richard Awid, the event did take place. The first half of the proceedings were monitored by two officers of the Edmonton Police Service’s Hate Crime Unit. The police officers may have been instructed to intervene in this way by officials of the B’nai Brith, the oldest “Jewish services” organization in North America. The Canadian branch of the B’nai Brith is deeply intertwined with the federal government led by Prime Minister Stephen Harper whose current bid for re-election is arguably based on a steady and unrelenting stream of hate speech. The Stephen Harper neocons are presently seeking a second majority mandate from the Canadian electorate by presenting themselves as the leaders of a anti-Muslim jihad campaign involving the Canadian Armed Forces, Canada’s heavily politicized police forces, together with the media empire of the New York-based Golden Tree Hedge Fund. Paul Godfrey is the chief intermediary linking the Golden Tree investor group with the Zionist-dominated Postmedia and Sun News outlets that dominate key facets of mass communications in Canada. The Postmedia newspaper chain was given its current extreme form of pro-Israel spin by former media mogul Conrad Black who initially hired Jonathan Kay. Kay has authored a classic hate-speech diatribe including a calculated smear job directed at Dr. Barrett. Entitled Among The Truthers: A Journey into the Growing Conspiracist Underground of 9/11 Truthers, Birthers, Armageddonites, Vaccine Hysterics and Internet Addicts, Kay’s book was published by Rupert Murdoch’s media network. Kay’s disinfo text received backing from the Foundation for the Defense of Democracies, a pro-Israel, anti-Iranian lobby group whose key membership is derived from the now notorious neocon think tank, the Project for the New American Century. I spoke to Richard Awid, the manager of the Rossdale Community League Hall close to the banks of the North Saskatchewan River in the capital of the oil-rich province of Alberta, now known widely as Texas North as well as Stephen Harper’s primary political base. In our conversation Mr. Awid explained to me that he is a Muslim whose Muslim ancestors arrived in Canada in 1901. Perhaps Ms. Hohman and her B’nai Brith colleagues have simply taken at face value the disinformation on Dr. Barrett published by Jonathan Kay in Among The Truthers. Apparently the B’nai Brith like Mr. Kay, one of the ghost writers of Justin Trudeau’s recent autobiography, felt it unnecessary to address the evidence of what did or did not happen on 9/11 before smearing those that have questioned various aspects of the now-thoroughly-discredited official cover story. Mr. Awid explained how he felt compelled by the B’nai Brith’s alarming message to do due diligence in order investigate Ms. Hohmann’s unsupported allegations. He outlined for me how he did his own Internet research and contacted the Edmonton Police Service. In discussing his own investigations Mr. Awid made it very clear that Stephen Harper and his Defense Minister, Jason Kenney, seem to be conducting their own hate speech campaign directed against Muslims as part of their electioneering. Mr. Awid referred to the “ignorance” of top Conservative Party of Canada officials and their blanket targeting of Muslims generically as the “enemy” or as potential enemies. The inflaming and political exploitation of Islamophobia by the Canadian government’s reigning cabal is without a doubt wreaking havoc with the relative civil harmony that once characterized Canada before the election-fraud racketeers took charge in Ottawa. Mr. Awid might have added that, by some calculations, about 4,000,000 Muslims have died so far from the so-called Global War on Terror, a psy op fuelled by a toxic brew of hate speech disinformation. Mr. Awid referred to the Tervor Aaronson’s The Terror Factory: Inside the FBI’s Manufactured War on Terror. That volume demonstrates that the FBI has played a major role in manufacturing and facilitating the very terrorism it claims to have pre-empted or solved. The manipulation of unstable individuals to provide the manufactured imagery of Islamic terrorism is the federal police force’s classic modus operandi. As I have explained at length in an earlier article in Veterans Today, this type of manipulation by undercover agents in Canada (including the FBI?) probably formed the backstory to the shooting incident in Ottawa on Parliament Hill on October 22, 2014. This event was used to justify Bill C-51, now the Anti-Terrorism Act of 2015, which Rocco Galati and others have observed replicates much of the legislation supporting the the fascist governments in Germany and Italy in the 1930s. 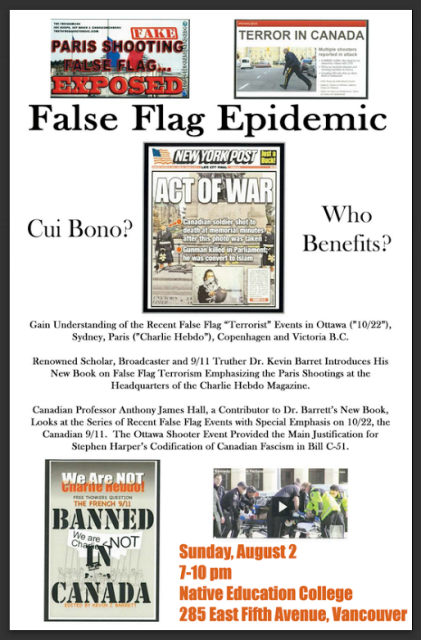 As I wrote in “Witch Hunt on Terrorism,” my own article in We Are Not Charlie Hebdo: Free Thinkers Question the French 9/11, the Ottawa Shooting event of 10/22, (Oct. 22, 2014) initiated a series of apparent false flag events extending to Sydney Australia and then Paris France and then Copenhagen in Denmark. The circulation of disinformation concerning such events to whip up anti-Muslim hysteria is itself hate speech of the most malicious kind giving sustenance to a kind of contemporary war against Islam whose major conceptual outlines can be traced back to the Jerusalem conference organized by Benjamin Netanyahu in 1979.